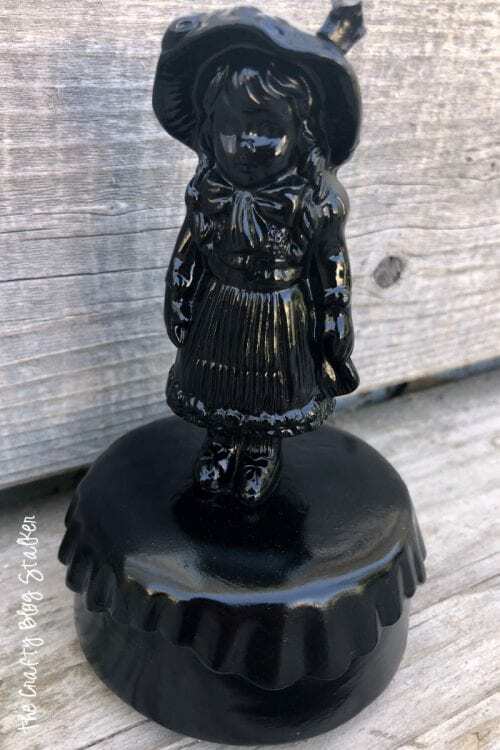 Create a Creepy and Spooky Haunted Figurine for Halloween Decor. 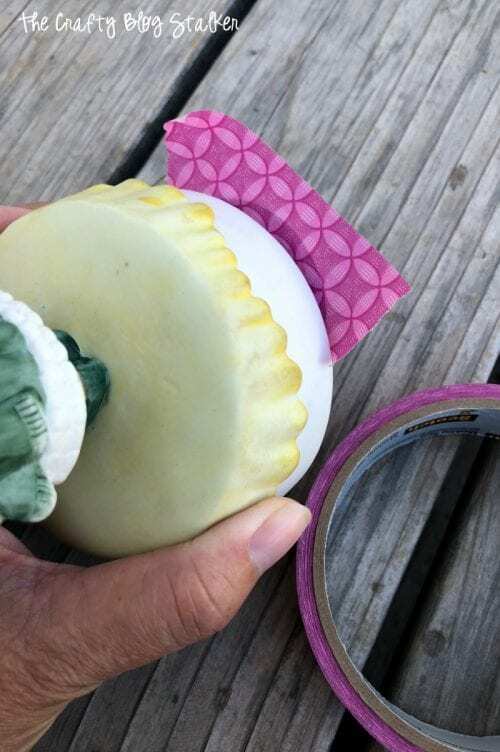 Shop the Thrift Store for this fun DIY. 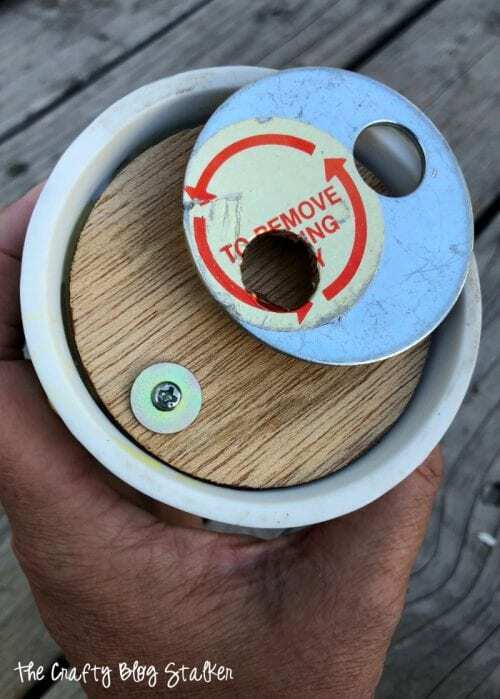 Easy Craft Tutorial Idea. Are you a fan of the creepy and the weird? Usually, I am not. I hate scary movies, especially if it has anything to do with the supernatural. BUT, when it comes to Halloween I love the dark and creepy decorations. Yup, I’m a weird one! 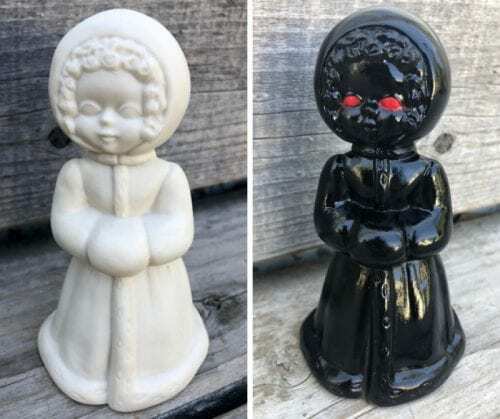 Today I am going to show you how to turn cheap Thrift Store porcelain figures into a creepy and haunted figurine for Halloween! Although sometimes, a coat of paint isn’t needed for the creepy. They are that way all on their own! 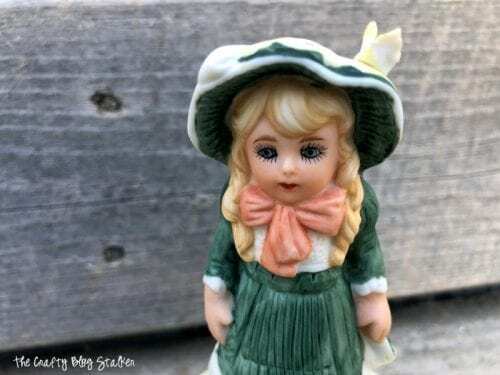 Whoever created this Porcelain musical figurine was probably really proud of the detail and thought it was very cute. I am sorry, but I think it is CREEEE-PEEEEEE! Those eyes! They give me chills! Plus the music box plays super slow no matter how wound up, so that doesn’t help! 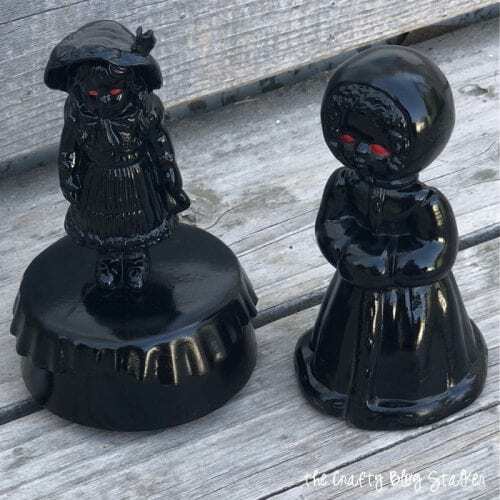 That makes this the perfect subject for my haunted figurine. Plus it was only $1! I love cheap crafts! 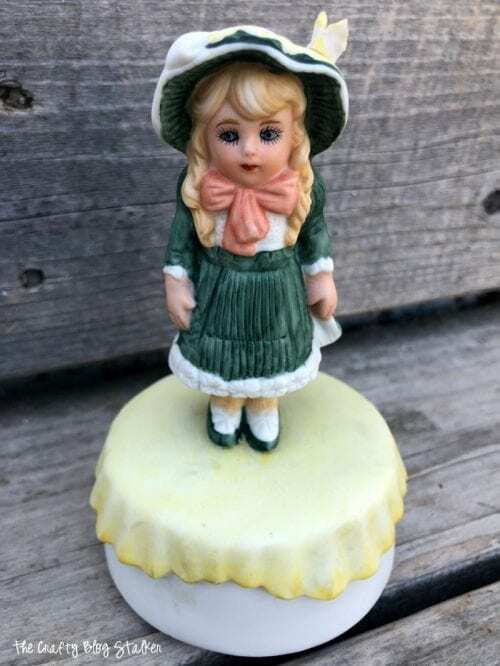 To begin, I tried removing the music box from the figurine, but even after I removed the screws it will still not come out of the porcelain figure. So I decided to let it be and reinserted the screws. And simply applied a strip of tape of the metal stand that was sticking out from the stand so it wouldn’t get painted. 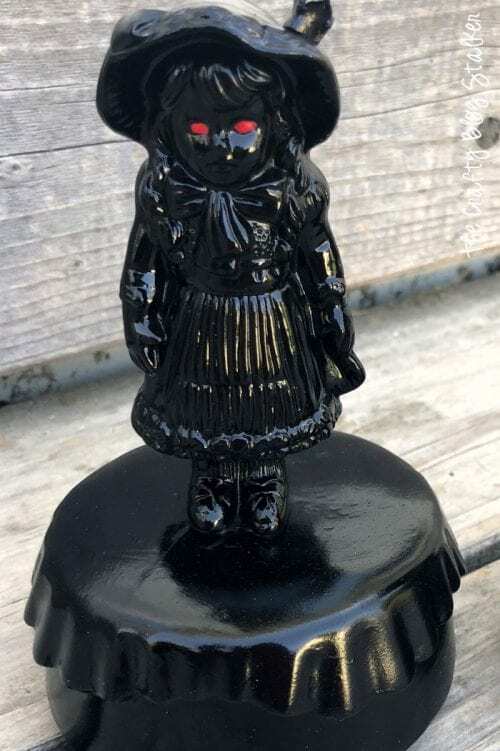 I turned the figurine upside down and sprayed the underside first with the black spray paint making sure that the pain underneath was all covered. Then set aside to try for 20 minutes. 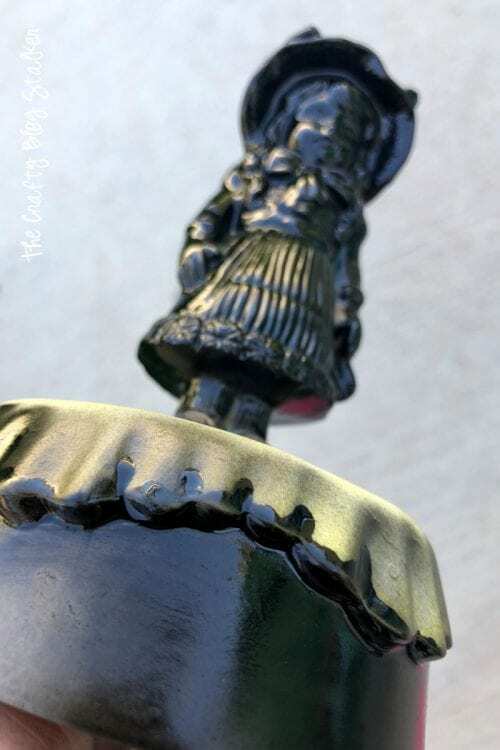 Once dry, applied the spray paint over the figurine right side up. This got the rest of the figurine covered nicely in black paint. Again, I let it dry for about 20 to 30 minutes. 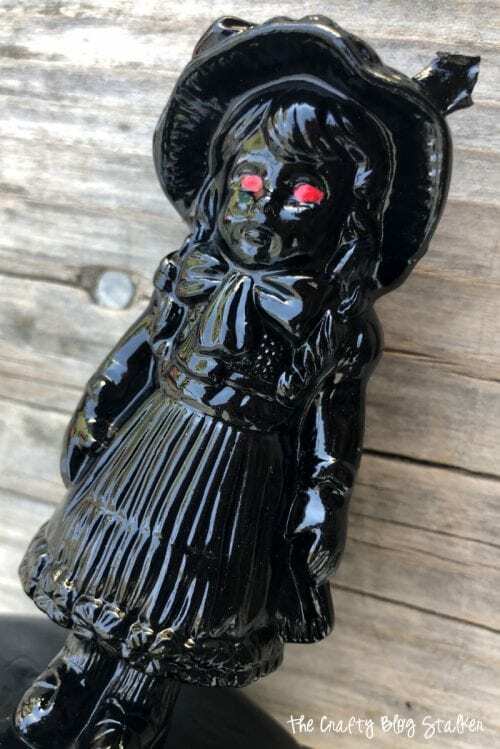 It is still pretty creepy all black, don’t you think? Next, come the eyes! Put a small amount of Metallic Red Pain into a plastic paint tray. You really don’t need much paint because the eyes are so little! I used the tip of a wooden skewer to paint the eyes in. The skewer gave me lots of control like a pencil but doesn’t paint like a brush, so you have to more dab the paint into place. With the glowing red eyes, now we are really in creep town! And it is even creepier with the slow turning and the music box! 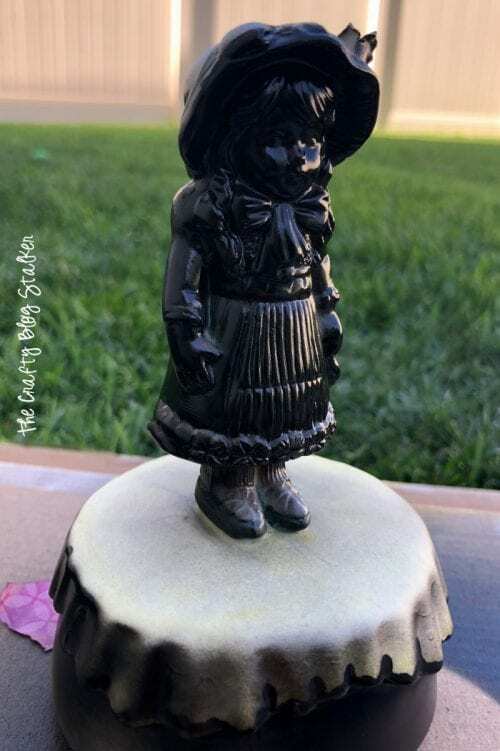 I made another haunted figurine because when I was at the thrift store I found another creepy porcelain figure. Why are there so many creepy figurines out there?! This project is a really easy one to do! 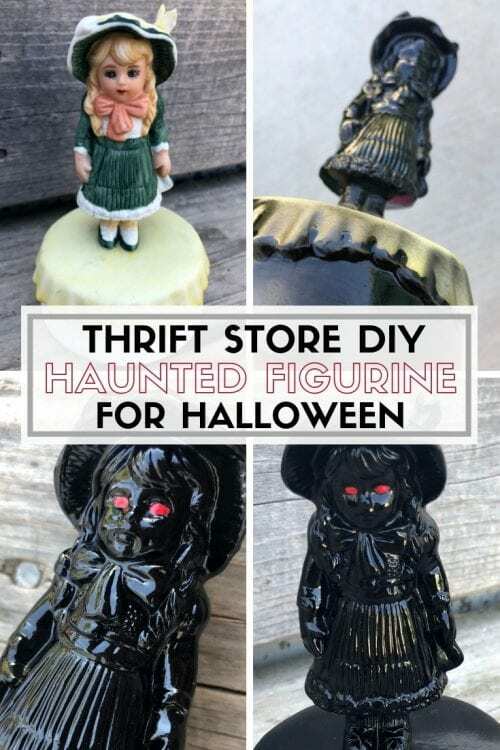 Plus, you’ve created haunted figurines to add to your Halloween Display! What Creepy Halloween Decorations have you made for All Hallows’ Eve? Share and leave a comment below. 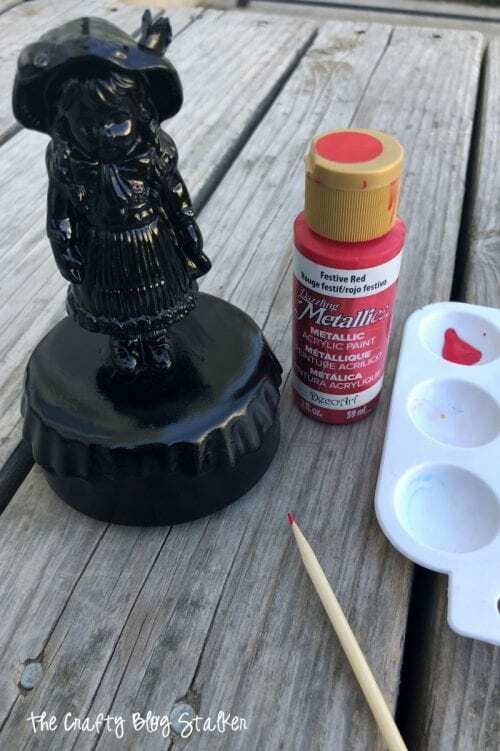 SAVE HOW TO MAKE A HAUNTED FIGURINE FOR HALLOWEEN DECOR TO YOUR FAVORITE DIY PINTEREST BOARD! IT looks creepy and beautiful! LOL! Thanks Karin! That is exactly what I was going for!